It was inevitable. Much like Oprah Winfrey’s television comeback, Prince William’s rapid balding, or Nicole Elizabeth “Snooki” Polizzi’s pregnancy. For a start, we don’t have an official political party, within a highly civilized nation, created specifically to advocate our demise. The Anti-PowerPoint Party, or better known as the infamous APPP, was established in Switzerland by former software engineer Matthias Poehm in the lead-up to Switzerland’s 2011 federal elections. The APPP went to the 2011 ballot box with one proposal: Ban PowerPoint. The APPP claimed the presentation software was causing an annual economic loss of 2.1 billion Swiss Francs (roughly US$2.5 billion). More broadly, the party suggested that PowerPoint was resulting in annual wastage of some €110 billion (US$160 billion) across Europe. The APPP’s calculations were based on the number of employees subjected to PowerPoint presentations each week, with the hypothesis that that time was completely wasted for approximately 85 percent of the audience. Why is Storyboard better than PowerPoint for the presentation and communication of BI content? But we think there are a few other good reasons why Storyboard is better suited to the presentation and communication of BI content. Firstly, it’s a purpose built module that’s fully integrated into Yellowfin’s BI platform, so you can view your corporate data in context – Storyboard comes with a standard Yellowfin license. By blending BI with a comprehensive presentation platform, Storyboard enables users to integrate fully interactive data-rich presentations into their natural decision-making processes, to generate an analytics culture, realize a better BI Return on Investment (ROI) and drive real fact-based action. As a completely Web-based presentation platform, Storyboard can be shared and viewed anywhere, anytime. There are many advantages. Being Web-based also ensures that all users, permitted to view a Storyboard, have access to one uniform version. 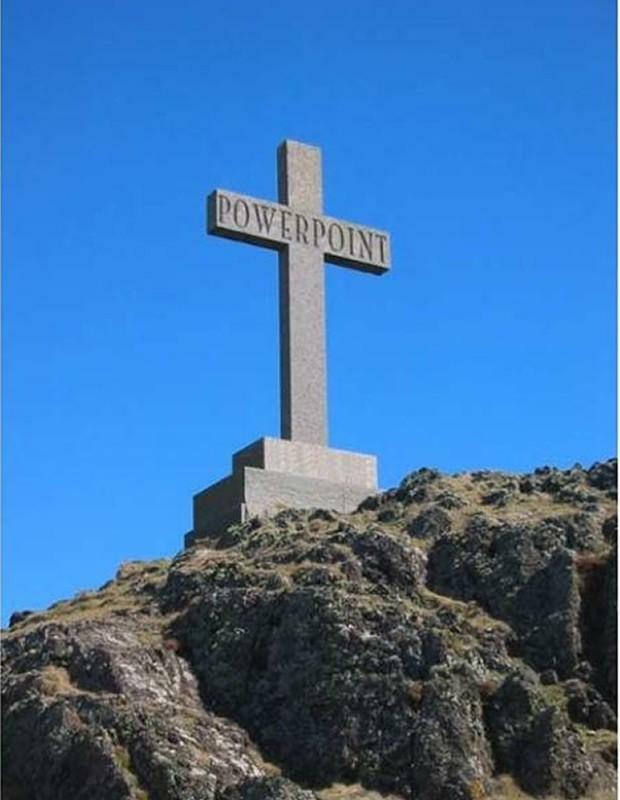 We’ve all worked on PowerPoint presentations with friends or colleagues that have ended in utter confusion. Storyboard lets you keep control of your important data-based corporate presentations before they take on a monolithic life of their own. Forget outdated figures and approximations. Storyboard lets you add charts and graphs to each slide of your presentation that return real-time data. Know you’re always sharing the most relevant data possible with Storyboard. Don’t be restricted by high-level overviews of your critical data. Storyboard lets you drill into the detail of your reports to reveal underlying trends and specific events that gave rise to particular trends in your data. Storyboards can be saved and archived for later reference. Storyboard archiving lets users update an existing Storyboard, while storing a copy of the previous and original Storyboards. For example, a Sales Rep can deliver the monthly sales report by simply updating the commentary for last month’s sales Storyboard – the associated reports are live and will have updated automatically to reflect results for the current month. But, the Sales Rep can easily access versions from the previous months, with the report data also reflecting that snapshot in time. And, Storyboard auto-save means that if a mistake or an unwanted addition is introduced, the presentation can be easily rolled-back to the previous version. Ever wanted to know who actually bothered to look at that PowerPoint you emailed around; or include sensitive information with absolute confidence that it won’t fall into the wrong hands? Well, with Storyboard you can. Each specific Storyboard presentation is auditable. Users can monitor how many, and which, users have viewed each Storyboard. Data and information security is also assured. Access, commenting and editing rights to each Storyboard can be restricted to specific user types or individual users. 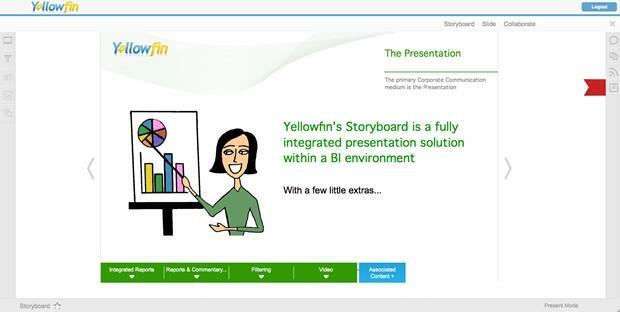 Research indicates that Collaborative BI functionality, particularly that integrated with data presentation capabilities, are gaining in popularity – all of which are embraced in Yellowfin’s Storyboard. Such Collaborative BI competences are widely viewed as BI’s missing link, capable of complimenting the consumerization of BI and driving greater BI usage and ROI. Wayne Eckerson’s recent Collaborative Business Intelligence: Optimizing the Process of Making Decisions report found that 87 percent of BI professionals believe that “collaboration tools can have a positive impact on analysis and decision-making activities”. Significantly, when survey respondents were asked to list their preferred method for making decisions based on BI content, 92 percent listed “hold meetings”. The next most popular approach to decision-making based on BI content (emails) was a distant second place (67%). It’s no secret. People like to make crucial decisions together; face-to-face. Why would it be any different when acting on the information produced by BI? Decision-making – especially when making important ones – is an inherently collaborative process. Storyboard compliments and facilitates that process. Yellowfin’s Storyboard is a revolutionary new approach to BI and business communications, and is set to rewrite the way people consume and act on their data. Storyboard’s presentation-oriented User Interface signifies a new paradigm for information sharing and decision-making, enabling a wider community of people with non data-centric backgrounds to benefit from the insights of BI. Stay tuned for the ensuing installment, where we’ll continue to outline why Storyboard – PowerPoint comparison is almost unavoidable, and why Storyboard should be your new corporate standard for communicating and presenting BI content.